Scott Arbeiter - A series at Elmbrook Church. Last night we did the Saturday night service thing. Kavs had to be gone this morning and we wanted to go to church together. The sermon: "Storing up your treasures in heaven...Easier said than done." A harder challenge, in my opinion: Not storing up your treasures on earth...10x harder. I can't help, but wonder what people in Oklahoma would be thinking of this sermon. Now that they have nothing. Now that they have to start new. What would they say to those of us who haven't been struck with this kind of tragedy? We live in a culture that craves the next best thing. Greed is our middle name. Work harder. Longer. Attain more...stuff. More vacations. More respect. More power. More success. But success by what standard? Our lives are a flash in the pan here on earth. A blink. Do we really want to place value in our life based on the treasures we stored up here? Does anyone ever look back on our death bed and say, "yeah...I should have worked harder to get that promotion?" or "I wish I would have spent more time working on that hobby of mine, and less time loving on my kids?" Important: God speaks a lot on working hard. Its GOOD. It is EXPECTED. Wealth is not bad! It all just depends on what we do with it and how we value it. Would you be able to loose your possessions and be okay with it? The problem with a sermon like this, is our first inclination is usually to point fingers. The first thing we do is think, "I wish _____ was here to hear this!" Important take-away for me last night: Don't judge others, judge yourself. Looking at my life, I don't think about it much, but I definitely struggle with greed. Not necessarily always expensive things, like a great car or a big house, but silly things that I do daily and would't want to live without. Of course, it is not a bad thing to love to run, but if I were honest...I probably value it more than I should. If God asked me to take it away? It would be so hard and much more challenging than I care to admit. I am greedy and crave that time. Also, I enjoy feminine things and being a woman. Clothes, hair, make-up. It is fun to embrace my femininity. None of the above are bad. However...Im ashamed to say this. If you asked to take away my hair dryer. My straightener. My mascara. I can tell you I would not be extraordinarily humble and hand them over to you. Treasures on earth are so, so hard. Oh, Lord...I want to be broken of the things I hold onto so tightly. Horatio Spafford lost so much more that I could ever imagine. He wrote one of my favorite hymns, "It is Well with My Soul." I cannot utter the words of this precious hymn without bawling. The reason I love it? It was written in 1871 after a series of horrific tragedies occurred in his life. His success as a lawyer was diminished after the Chicago Fire took everything he had financially. Then, the economy turned sour and he sent his family overseas to start new. He planned to follow them after he finished his business there. Shortly thereafter, He received a telegram from his wife "Saved alone..."
His wife survived, but all four of his daughters died as the ship transporting them sunk rapidly after a collision with a sea vessel. Wow...so when did he write "It is well with my soul?" Horatio was inspired to write these words as his ship passed near where his daughters had died. Tears well up just thinking about it. If I were to go through something like Horatio did or like those in Oklahoma have,...if all of my comforts and treasures were stripped from me, those that I love most and things I hold so dear...I pray that it would be "well with my soul." I heard last night that a mission serving in Oklahoma was blown away. 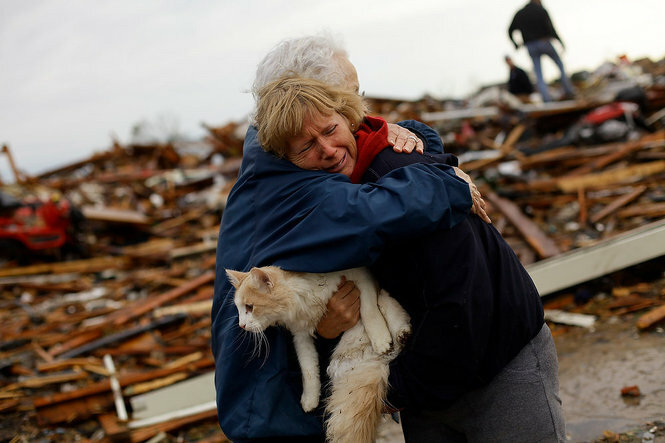 As volunteers helped clean up the rubble and restore homes...Oklahoma natives were singing hymns as they worked. I can hardly write this without my heart swelling. --- What would your children say you treasure? (I have not yet been blessed with children, but it would break my heart to think of them one day saying..."my mom treasures decorating her home, fashion,...creating." --- When you give back, do you pride yourself in looking at how much you gave or do you look at how much you kept for yourself? --- If someone asked you to borrow your treasure, would you be okay with giving it away? Im not trying to accomplish anything by this post. Just some convicting thoughts from my heart. My heart is heavy, but my hope is vast. If my treasure is in heaven, it will affect everything I do. What I value. How I treat others.